Bobby Osborne and his band the Rocky Top X-Press celebrate his 60 years in bluegrass with his latest recording, Memories. From his first recorded hit in 1949, to his membership in The Grand Ole Opry in 1964, to Rocky Top in 1967, Bobby Osborne has been one of the most influential singers and mandolin players in the history of Bluegrass and Country music. 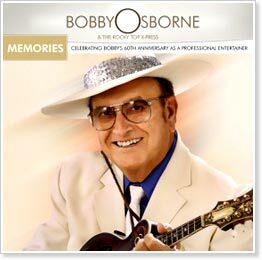 Memories, (Celebrating Bobby's 60th Anniversary as a Professional Entertainer) was produced by Glen Duncan, Bobby Osborne and Bobby Osborne, Jr. and contains many golden classics and new original songs written especially for this celebratory album including the first single release, Bring Back Yesterday." This song certainly showcases Bobby's one-of-a-kind lead vocals and that familiar sound of the legendary Osborne trio. Many special guests have come together to join this Bluegrass and Country legend at the top of his game, and celebrate this 60-year recording milestone with his band The Rocky Top X-Press. These special guests include fellow Grand Ole Opry star Patty Loveless, David Grisman, Russell Moore, Ronnie McCoury, Sammy Shelor, Audie Blaylock and David Harvey. Another very rare performance by a special guest on the album is the popular Japanese actor, storyteller, narrator of children's movies, and accomplished bluegrass musician on both mandolin and shamisen, Takeharu Kunimoto who performs with his shamisen on Up This Hill and Down.